Today I would like to share with you my latest project for Dragonfly Dreams. The challenge this month is Use a Die Cut. The image I used is Air Fairy from Fabrika Fantasy. 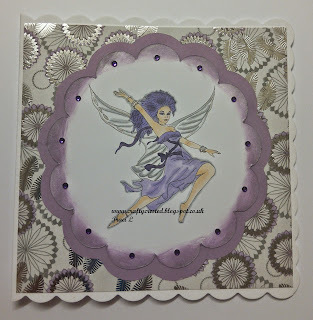 Gorgeous card, that image is wonderful and I love that you colored her in lavender! Sweet card. Thanks for joining us at Scrapping 4 Fun. Beautiful card! Thanks for joining us at Scrapping4Fun Challenges. Hope to see you again soon!! HUGS! Sweet image and card. Thanks for joining us at Inspiration Destination. Oh superb card ! Thanks for playing with us at the Cute As A Button's challenge ! Very interesting design! 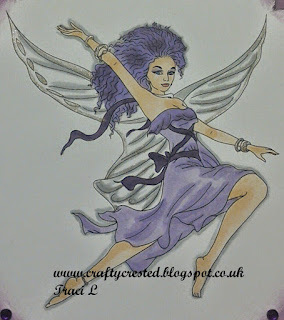 It looks like this Air Fairy is flying over the field with lots of flowers! Thank you for using this image, Traci. A beautiful card and lovely colouring. Thank you for entering it in our challenge at Digi choosday. Ladies, ladies, ladies. She looks as if she is leaping in the air with joy! Love it! Thank you so much for entering the Crafty Calendar (Mother's Day/Special Female) Challenge this month, lots of luck to you. Hugs Sue Pxxx DT. Thanks for sharing in Crafting with An Attitude, good luck. Beautiful design - love the colours you've used. Thank-you for joining us at the Crafts Galore Encore Challenge March "Make a Card".